Here's the story behind the biotech stock that could be the best way to profit from the discovery of the century: CRISPR-Cas9 gene editing. A revolutionary technology and only a handful of stocks you can buy to profit from it. That's the scenario for gene editing, a scientific breakthrough that holds the promise to radically change how diseases are treated. You can count the number of gene-editing stocks currently available on both hands and still have fingers to spare. One of the top gene-editing stocks on the market is Editas Medicine (NASDAQ:EDIT). The biotech has been in business for less than five years and has only traded publicly for a little over two years. During that time, though, Editas has made significant progress with its research. And its stock has more than doubled in value. 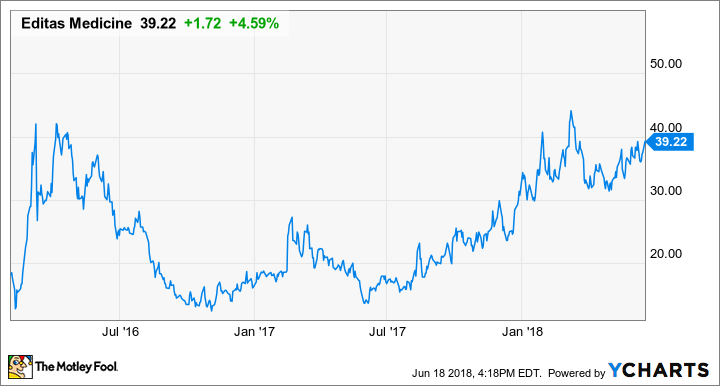 Here's how Editas has become a gene-editing success story -- and why the stock could be a smart one to buy for long-term investors. Editas Medicine's roots stretch back in a way at least to 1953, when James Watson and Francis Crick discovered the double-helix structure of deoxyribonucleic acid, or DNA. This discovery sparked a race by scientists to unravel the genetic code of humans. However, it took another five decades before researchers found a way to change the genetic code. In the early 1990s, scientists found that they could engineer zinc-finger nucleases (ZFNs) to modify DNA sequences. ZFNs consist of zinc-finger proteins that find specific DNA sequences and enzymes known as nucleases, which cut DNA. Researchers discovered how to create a pair of ZFNs that functioned like molecular scissors to cut DNA at targeted locations. Engineering ZFNs wasn't easy. But for more than 15 years, it was the only game in town for gene editing. In 2009, another approach was developed: TALEN (transcription activator-like effector nucleases). In several respects, TALEN was like ZFN. The primary difference was that the newer method enabled researchers to target more specific sections of DNA for editing. The most exciting development in gene editing, however, came in 2012 with research showing that CRISPR-Cas9 could be used to modify targeted DNA sequences. CRISPR stands for clustered regularly interspaced short palindromic repeats. The name stems from DNA sequences that consist of palindromic (able to be read the same both forward and backward) repetitions with regular stretches of spacer DNA (a type of DNA that doesn't hold instructions for how to build proteins) between them. Cas9 is a specific type of CRISPR-associated system (Cas) protein. Scientists had known for several years that some bacteria used CRISPR-Cas9 to slice the DNA of attacking viruses as a self-defense mechanism. However, a paper published in June 2012 by Emmanuelle Charpentier and Jennifer Doudna identified how this bacterial system could be co-opted by humans to edit DNA. In January 2013, Feng Zhang with the Broad Institute of MIT and Harvard successfully used CRISPR-Cas9 to edit human and mouse cells. Harvard's George Church and his team reported similar success around the same time. CRISPR-Cas9 proved to be simpler, faster, and cheaper than either of the previous gene-editing techniques. Zhang, Church, and Doudna teamed up with two other respected scientists, Harvard's Keith Joung and David Liu, to launch a company to explore commercialization of the promising CRISPR-Cas9 technology. In September 2013, Gengine, Inc. was founded. Two months later, Gengine changed its name to Editas Medicine. Venture capital firms Flagship Ventures, Polaris Partners, and Third Rock Ventures, along with the Partners Innovation Fund established by the Massachusetts General Hospital and Brigham and Women's Hospital, led an initial financing round that raised $43 million for the new biotech. Polaris Partners principal Kevin Bitterman joined Editas as interim CEO while a full-time executive to lead the company was found. In April 2014, the Broad Institute won the first U.S. patent ever for an engineered CRISPR-Cas9 system for use in gene editing. This patent was based on the research led by Feng Zhang, a core member of the Broad Institute and one of the co-founders of Editas Medicine, in using CRISPR-Cas9 to edit eukaryotic cells (cells that contain a nucleus, including all cells in humans and animals). A few weeks after the patent was issued by the U.S. Patent and Trademark Office, Jennifer Doudna left Editas. She later joined rival CRISPR-focused biotech Intellia Therapeutics (NASDAQ:NTLA) as a scientific advisor and "founding member," although Intellia had actually been founded nearly a year earlier. Editas hired Katrine Bosley as its new CEO in June 2014, with interim CEO Kevin Bitterman remaining on the board of directors. Bosley previously served as an entrepreneur-in-residence at the Broad Institute. She was CEO of Avila Therapeutics for several years until the company was acquired by Celgene in 2012. Under Bosley's leadership, Editas exclusively licensed the CRISPR-Cas9 intellectual property owned by the Broad Institute and Harvard University in December 2014. The biotech also licensed gene-editing intellectual property of Duke University and Massachusetts General Hospital at the same time. Editas continued to make progress in researching CRISPR-Cas9 throughout 2014 and 2015. The biotech made six presentations at the May 2015 annual meeting of the American Society of Gene & Cell Therapy that provided clues about what was to come for Editas. One of those presentations described how Editas researchers engineered a Cas9 protein from the Staphylococcus aureus bacteria to correct a mutation in the CEP290 gene. The mutation that was corrected using gene editing causes Leber congenital amaurosis type 10 (LCA10), a rare retinal disease and the top cause of inherited childhood blindness. The LCA10 program became Editas' lead pipeline candidate. Editas also presented data on the use of different Cas9 proteins in editing T cells, white blood cells produced in the thymus gland that are key to the body's immune system. A few weeks after this presentation, Editas announced a partnership with Juno Therapeutics to use gene-editing approaches, including CRISPR-Cas9, to modify T cells to fight cancer as part of Juno's chimeric antigen receptor (CAR-T) and high-affinity T cell receptor (TCR) therapies. Juno was acquired by Celgene in January 2018. Venture capital funds continued to be very interested in the potential for CRISPR gene editing and in biotechs, including Editas, that were pioneering the technology. Editas easily raised another $120 million in private financing in August 2015. But it was evident that the company wouldn't remain privately held for too much longer. In February 2016, Editas conducted its initial public offering (IPO). The biotech's IPO price was $16 per share. Editas' share price quickly jumped much higher. As the historical prices chart above shows, however, Editas stock stayed at its lofty levels for only a few months. There were three primary reasons why Editas subsequently gave up its huge gains. One was that biotech stocks in general experienced a really volatile year in 2016. Remember, this was an election year in which one presidential candidate singled out a drugmaker for "predatory pricing." Biotech investors were nervous, to say the least. Another issue for Editas was that the company quickly claimed a market cap of close to $1.5 billion despite the likelihood that it wouldn't have a product on the market for years. Some investors who bought early no doubt decided to take profits relatively early as well. But the most significant headwind for Editas related to a patent dispute over CRISPR-Cas9. The University of California, Berkley (UCB) submitted a filing to the Patent Trial and Appeal Board of the U.S. Patent and Trademark Office in April 2015 suggesting that the awarding of patents to the Broad Institute interfered with a patent application made by UCB on behalf of itself, the University of Vienna, and CRISPR pioneer Emmanuelle Charpentier. In March 2016, the two parties in the litigation filed their lists of proposed motions. These lists revealed that UCB alleged that Editas co-founder Feng Zhang didn't correctly represent his discoveries on patent applications. UCB also contested the timing of the Broad Institute's patent. Prior to March 16, 2013, all U.S. patents were awarded to the party that first invented a new product or process. Thanks to a change in U.S. patent law, though, after that date patents are awarded to the first party to file for a new invention. However, patent applications made after March 16, 2013, could be grandfathered in under the previous rules if the invention was made before the new regulations took effect. Although the Broad Institute filed for its CRISPR patents after the date the changes became effective, it asserted that the discoveries were made in December 2012. UCB, however, claimed that some of the Broad Institute inventions were made after the effective date and therefore the Broad Institute's patents shouldn't be allowed to compete with the UCB patents. Sound confusing? It did to investors in 2016 after Editas Medicine's IPO. It also led to concerns that Editas could wind up having to spend a lot of money to license intellectual property from UCB if the Broad Institute lost the patent battle. Lingering doubts hovered over Editas' stock like a dark cloud for months. Three major developments helped Editas to recover. The first occurred in December 2016 when the biotech announced that it had exclusively licensed new CRISPR technology from the Broad Institute, Harvard, Massachusetts Institute of Technology, Wageningen University, the University of Iowa, and the University of Tokyo. A key part of this newly licensed intellectual property related to a new CRISPR gene-editing approach using Cpf1, a protein in Prevotella and Francisella bacteria. Like Cas9, Cpf1 can cut targeted DNA sequences. The advantages of Cpf1 are that it's even simpler than Cas9 to engineer, it can be used to edit more parts of the genome, and it has better accuracy for certain types of gene repair. Editas Medicine's second win, though, was a shot heard around the biotech world. In February 2017, the U.S. Patent and Trademark Office ruled that the Broad Institute's CRISPR-Cas9 patents did not interfere with UCB's patent applications. Editas' stock skyrocketed on the news while the stocks of biotechs allied with UCB -- CRISPR Therapeutics (NASDAQ:CRSP) and Intellia Therapeutics -- plummeted. The decision by the U.S. Patent and Trademark Office meant that Editas Medicine wouldn't have to shell out additional money to license intellectual property from UCB. Even better, it meant that other biotechs would likely have to pay Editas to develop CRISPR-Cas9 therapies targeting indications that Editas is also targeting. This huge patent victory set up Editas for its third win. In March 2017, the company announced a partnership with Allergan (NYSE:AGN) to develop CRISPR-based therapies for eye diseases. Allergan paid Editas $90 million up front for the option to license up to five of Editas' eye-disease programs, including its lead candidate targeting treatment of LCA10. Under the terms of the deal, Editas will also be eligible for development and commercial milestone payments and royalties on any future sales. Another important aspect of the agreement with Allergan is that Editas has the right to co-develop and co-market up to two of its eye-disease programs in the U.S. This is key, since the U.S. market is where drugmakers typically make most of their profits. Although Editas Medicine stock went on a tear throughout much of 2017 and so far in 2018, there have been a few controversies that caused problems -- at least temporarily. In May 2017, a study published in Nature Methods stated that CRISPR-Cas9 could cause hundreds of unexpected mutations. Editas' stock immediately tanked, as did shares of CRISPR Therapeutics and Intellia Therapeutics. These unexpected mutations, also called off-target effects, had been a worry for earlier types of gene editing as well. CRISPR-Cas9, though, had been touted as a more precise method. The study was definitely concerning to investors. Scientists from Editas, CRISPR Therapeutics, and Intellia, however, knew what they seeing in their own testing and disputed the findings published in the Nature Methods article. As it turned out, the biotechs were right. In April 2018, the authors of the paper issued a retraction and an error correction. Instead of hundreds of unexpected mutations, they stated that "CRISPR-Cas9 editing can precisely edit the genome at the organismal level and may not introduce numerous, unintended, off-target mutations." But before that issue was settled, another one emerged. In January 2018, researchers published a paper on bioRxiv (pronounced "bio archive"), a website that features preprint biology papers that haven't been peer-reviewed. This paper suggested that many people could have immune responses to Cas9 that interfere with the ability of CRISPR-Cas9 to work effectively. CRISPR-focused biotech stocks like Editas fell at first, but they quickly rebounded. The issue was seen as a legitimate concern. However, many viewed the immune response problem as a speed bump rather than a roadblock. It's not known if the immune response issue will really be a serious one that affects the use of CRISPR-Cas9. And even if it does, there are several potential workarounds, including developing Cas proteins from bacteria that don't infect humans and tweaking Cas9 so that it acts before the immune system can fight back. The most recent scare for Editas related to the possibility that CRISPR-Cas9 could cause cancer. Two papers published in Nature Medicine in June 2018 found that CRISPR-Cas9 works better in cells with p53 gene mutations. The bad news is that mutations in this gene are linked to an increased risk of several types of cancer. While Editas' stock initially dropped on the potential link between CRISPR-Cas9 and cancer risk, it recovered within a few days. The issue only impacts gene-editing therapies that insert a new DNA sequence into a gene. Editas' lead candidate targeting LCA10 only deletes DNA without inserting new DNA and is therefore not impacted by the potential problem. As is the case with the immune response issue, there could also be workarounds with this latest challenge. For example, it's possible that other bacterial enzymes used for CRISPR gene editing don't have the same effect as Cas9 does. What's next for Editas Medicine? These kinds of reports can be problematic for Editas Medicine. Over the long run, though, the biotech's fortunes depend on advancing its pipeline candidates, winning regulatory approval, and successfully commercializing the products. Alpha-1 antitrypsin deficiency (AATD) Disease resulting from mutations in the SERPINA1 gene. Causes lung disease and liver damage. Affects around 1 in 1,500 to 3,500 individuals with European ancestry but isn't as common in other ancestries. Beta-thalassemia Disease resulting from mutations in the HBB gene. Causes a low production of hemoglobin, anemia, and an increased risk of developing blood clots. Occurs in around 1 in 10,000 people. Cystic fibrosis (CF) Disease resulting from mutations in the CFTR gene. Causes respiratory and digestive problems. Affects 1 in 2,500 to 3,500 Caucasian newborns but isn't as common in other individuals. Duchenne muscular dystrophy (DMD) Disease resulting from mutations in the DMD gene. Causes muscle weakness and damage. Occurs in an estimated 1 in 3,300 male births. Leber congenital amaurosis 10 (LCA10) Disease resulting from mutations in the CEP290 gene. Causes vision loss. Impacts around 2-3 per 100,000 live births. Sickle cell disease Disease resulting from mutations in the HBB gene. Causes anemia, infections, and pain. Affects 1 in 500 African-Americans and 1 in 1,000 to 1,400 Hispanic Americans. Usher syndrome type 2a Disease resulting from mutations in the USH2A gene. Causes hearing loss and vision loss. Impacts 1-9 out of 100,000 people. Data sources: National Institutes for Health (NIH), OrphaNet, and Editas Medicine. For now, the primary program investors should focus on is Editas Medicine's LCA10 candidate, EDIT-101. Editas successfully completed preclinical testing in non-human primates for the therapy. The biotech plans to soon submit for approval to begin phase 1 clinical studies. Editas isn't totally out of the woods with patent challenges, either. UCB is appealing the U.S. Patent and Trademark Office decision to a federal appeals court. The Broad Institute doesn't believe there are grounds for overturning the previous decision. Also, in January 2018 an initial review panel of the European Patent Office denied the Broad Institute's patent application for CRISPR-Cas9. The Broad Institute maintains, however, that this denial was the result of a "technical formality" rather than the scientific merit of the patent application and is appealing the initial decision. Is Editas Medicine a stock to buy? Editas Medicine stock is riskier than many stocks that you can buy. There's no guarantee that its therapies will be successful. CRISPR gene editing has never been tested in human clinical trials. More risks could be identified in addition to the issues that have already arisen. As of March 31, 2018, Editas had cash, cash equivalents, and marketable securities totaling $359 million. That should be enough to fund operations at least through early 2020. But Editas won't have a product on the market by that point, so the company will likely have to raise additional cash through a stock offering before then. That means that the value of existing shares will be diluted. When that happens, stock prices typically drop. Editas definitely isn't the kind of stock that investors who are very cautious or focused on the short term would want to buy. However, it's worth considering as a speculative play for long-term investors who would like to potentially profit from gene editing. As mentioned earlier, there are only a handful of biotech stocks focused on gene editing. In my view, Editas ranks as the best of these stocks. I think the company enjoys a stronger intellectual property position than its competitors because of the Broad Institute's U.S. patent victory. Editas could also be the first biotech to advance to a clinical study with a CRISPR-Cas9 therapy thanks to a clinical hold the U.S. Food and Drug Administration placed on CRISPR Therapeutics' plans to begin clinical testing of its therapy targeting treatment of sickle cell disease. The risks for Editas Medicine are certainly high, but so are the potential rewards for investors if the biotech is successful. Editor's note: A previous version of this article incorrectly stated that U.S. patents were based on first-to-file prior to March 6, 2013 and first-to-invest after that date. The old patent policy was instead based on first-to-invent and the current policy is based on first-to-file. The Fool regrets the error.